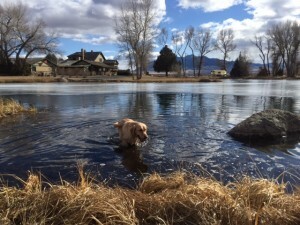 What could be more fun than a pond, a tennis ball and a Lab named Leon? How about a boat, a fly fishing guide, and you. We have quick and easy access to private creeks and streams, the Beaverhead, Big Hole, Jefferson, Madison and Ruby rivers. Healing Waters Lodge is “fish centric” with great food, clean comfortable lodgings, and beautiful surroundings.Give Mike Geary a call today 406-459-2030 today to talk about your fly fishing vacation with us! Tell him Leon sent you.